Did Ilhan Omar Dip Into Her Campaign Till Back Home? Representative Ilhan Omar, D-Minn., doesn’t hesitate to express her scorn for America, Jews and capitalism – not necessarily in that order. Indeed, her most enduring legislative achievement to date has been to send a February 10 tweet referring to the American Israel Public Affairs Committee as being “all about the Benjamins” (i.e., $100 bills). Yet it appears the Somalia-born Muslim freshman congresswoman, now 37, has ethics issues that are coming back to haunt her. They might not jeopardize her political career, but they just might dim the halo over her head in the eyes of her admirers. 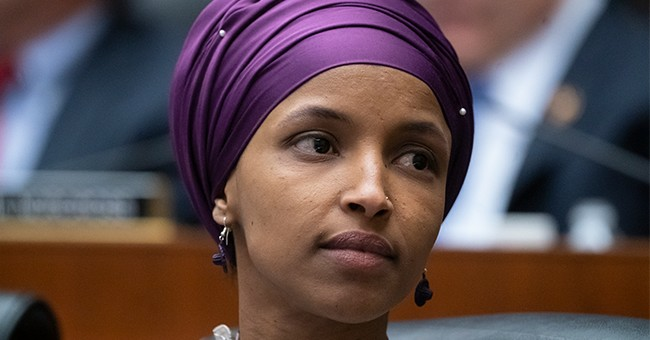 The Minnesota state lawmaker who filed the complaints, Rep. Steve Drazkowski (R-Mazeppa), believes Omar’s behavior is no aberration. “I had observed a long pattern,” says Drazkowski. “Representative Omar hasn’t followed the law. She’s repeatedly trampled on the laws of the state in a variety of areas, and gotten by with it.” When confronted about the investigation during a Minnesota Public Radio debate, Omar responded, “The truth is, I have never been really been cited for any campaign finance violation.” In fact, she has. Omar was fined more than $2,000 by the Minnesota Campaign Finance Board last year for late filings of campaign information unrelated to the two complaints. And she could face more serious disciplinary action in a separate matter. According to the board: “The Omar Committee’s 2017 year-end report shows several noncampaign disbursements for out-of-state travel for Rep. Omar to attend various events…The information on the committee’s 2017 year-end report does not indicate how attendance at these events would have helped Rep. Omar in the performance of her legislative duties.” That doesn’t even include $2,750 in fees she collected in 2017 for lectures that she gave on various state college campuses. Such compensation, notes Drazkowski, is banned by Minnesota House rules. At least she has repaid $2,500 of that. It is especially difficult to justify Ilhan Omar’s use of campaign funds for unrelated travel, which amounts to about half of the disputed $6,000. She had traveled to Boston in 2017 to speak at a rally on behalf of City Council candidate Deeko Jibril, who, like Ilhan Omar, arrived here from Somalia during the '90s as a refugee. Ms. Jibril lost in a crowded Democratic primary that September. Jibril already was experienced in street politics, having worked as a community outreach organizer for the victorious 2012 U.S. Senate campaign of Elizabeth Warren, D-Mass. Say this for Omar – she supports her own. What drew Ilhan Omar to the unlikely destination of Estonia was a European Young Leaders Summit held in September 2017 in that Baltic nation’s principal city of Tallinn. The conference, sponsored by a group known as Friends of Europe, was geared toward “making Europe a global champion for a better world.” An American attendee, Alex Budak, who could be seen chatting it up with future Congresswoman Omar, summarized his thoughts on his website: “As America retreats inwards; as nationalism rises once again in Europe; and as narratives of fear overtake those of hope, the opportunity to learn from and connect with diverse, globally-minded changemakers is imperative.” Take one guess as to what he and his compatriots have in mind for American immigration policy. The ulterior motives behind such events, crucial as they are, is a separate issue. What matters here is that Ilhan Omar is alleged to have dipped into her campaign coffers to participate in those events. This would be a serious violation of the public trust. Perhaps her congressional colleagues should take greater notice of such things. We will learn more about these accusations when the Minnesota Campaign Finance Board releases its findings. But one thing seems certain: Ilhan Omar has an affinity for “Benjamins” – in this case, about 60 of them – as long as she can spread them around to the right people.